Tell us about your team and we'll publish it! Once again, we are publishing short stories about the participating teams at the Junior Challenge website! 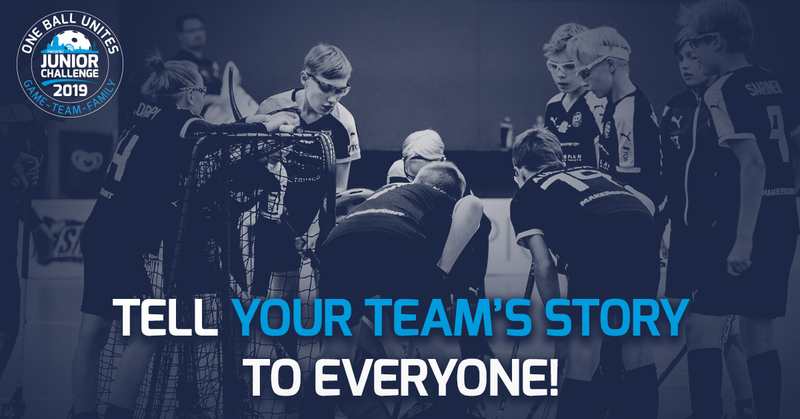 We would like you to answer couple of questions, so we could publish a story about your team. This is completely voluntary. Fill a form >> HERE! 4/18/19 Registration has ended - over 240 teams coming! 4/10/19 Helsinki Junior Challenge 2019 tournament shirt is here! 4/9/19 230 teams coming and overtime to registration! 3/25/19 Highlights from last year! 3/15/19 Over 100 registered teams! 3/13/19 Team story: Ekerö IK - "1 team, 1 group, 1 goal, 1 future"
2/27/19 Team story: Kalastajat - "We had an idea of going to win something else than Fortnite-matches"
2/20/19 Team story: Merikoski SBT 06 Tribes - "Catch us if you can!" 2/12/19 Team story: Täby FC F06 Gribby - "Positive floorball"